The ground floor direct ocean front one bedroom is in a great location for superb whale watching (seasonal) and just steps to the water where you sea turtles play. 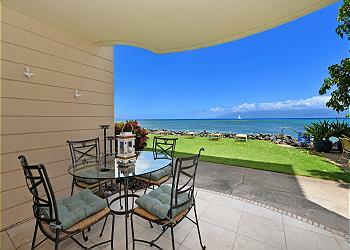 You can walk out to the grass area right from your lanai for sunbathing and viewing the spectacular Maui sunsets. This is a private and quiet condo located within easy walking distance to shopping and excellent restaurants at the Kahana Gateway Shopping Center. Kahana Reef is a four story concrete structure with two elevators and well maintained with attractive landscaped grounds that is direct ocean front.